The 50-50 Show II will fill all three galleries. Sixty-seven artists selected by juror Marian Parmenter, co-founder of SFMOMA Artists Gallery, will display the fruits of their fifty days of labor. Each artist commits to creating 50 small artworks at the rate of one per day for fifty days, using a single medium and a unified theme. Last year the results were spectacular, and we expect no less in 2010. All works are for sale at very reasonable prices, so plan to pick up some gems. The 50-50 Show II opens Friday, July 30, with a reception for the artists from 6 pm to 10 pm that is free and open to the public. Or you can be among the first to see the 50-50 Show II at our ticketed preview on Thursday, July 29, from 7 to 9 pm—beat the opening night crowds (about a thousand people came in 2009), view the exhibit in its entirety, and reserve purchases before the show opens to the general public. The number of preview tickets will be limited, so purchase yours early at Brown Paper Tickets: www.BrownPaperTickets.com or 1-800-838-3006. The cost is $10.98 through Brown Paper Tickets, or $20 at the door if tickets are still available. It takes an especially dedicated person to carry out this kind of commitment, to create a work of art every day, no weekends off, for 50 days in a row. On June 11 these artists gathered to share their work, ideas, and dilemmas with each other. How to price their work? What kind of glue to use? And, of course, how far behind are you? The artists who came together were inspired by each other’s creative vision and ingenuity, as well as helped by each other’s experience with different mediums and how to keep going for the long haul. “Just to be able to share the frustrations and joys along the way has been great,” said one artist. Each piece is six inches square, and each artist’s works are installed in a square grid, seven across and seven down, with the fiftieth piece off to the side. 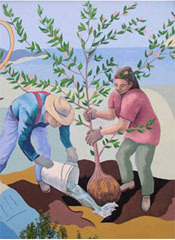 Each artist works with one overall theme and one art medium. The show is a fundraiser for Sanchez Art Center, so all works are for sale, and prices are eminently reasonable. Many artists are offering discounted prices for the purchase of more than one of their artworks. Buyers may take works home with them at the time of purchase. The range and diversity of subjects and mediums in 50-50 Show II is impressive, from abstract painting to landscapes and portraits, from photography to mixed media and collage, and from metal sculptures to folded paper works. There is a wealth of color, as well as striking works in black-and-white. 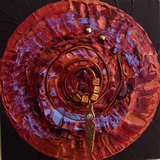 Barbara Downs’ theme is The Daily Bird, created in mixed media. Denny Holland paints oils of The Objects of Desire, such as reaching for the moon. Kenda Swartz Pepper creates Altar Art using acrylic paint and found objects. Goran Kojevod folds paper into astoundingly beautiful and intricate shapes. Richard Herring’s whimsical creatures delight, as does Bill Gallo’s magnificent tree with tiny figures such as angels, demons, flamingos, and a full mariachi band. Sharron Walker’s nature photographs create a moment of stillness in the midst of busy lives, while Susan Shore chose to photograph objects looking through a glass brick, creating wonderful patterns. 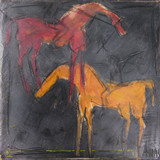 Susana Arias draws and paints a series of horses in a range of styles and colors. This is an art show everyone can enjoy, an incredible outpouring of creative energy and artistic achievement. Try not to miss it! 50-50 Show II will open with a ticketed preview on Thursday, July 29, from 7 to 9 pm. A limited number of tickets for the Thursday, July 29, preview may be purchased at BrownPaperTickets.com (1-800-838-3006). The free opening reception is on Friday, July 30, from 6 to 10 pm. 50-50 Show II will extend through Sunday, August 29. 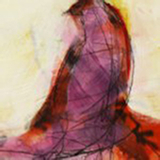 Gallery hours are Friday, Saturday, and Sunday from 1 to 5 p.m. Sanchez Art Center is located at 1220 Linda Mar Blvd. in Pacifica, California. For more information call 650-355-1894 or info@sanchezartcenter.org.